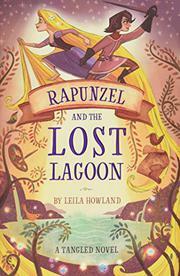 Rapunzel and Eugene return with a new adventure filled with friendship, mystery, and teachable moments. The story takes place soon after the movie Tangled left off. Rapunzel struggles with her new relationship with her parents as well as how she fits in as one of Corona’s royal family. One of Rapunzel’s first responsibilities, assigned by her mother, is to choose a lady-in-waiting. The captain of the guard’s daughter, Cassandra, catches her eye since she, too, does not quite seem to fit into this world. One day, while in the library, Rapunzel comes across a small book of poems, dusty and long forgotten. She and Cassandra realize the title poem, “The Lost Lagoon,” describes a real place that may hold the secret power of Corona. The young women try to find the secret and soon learn they are in a race against an unknown competitor. As revealed in chapters that alternate narration between Rapunzel and Cassandra, the two white girls struggle with their friendship, with their parents, and with their destinies. Young Disney fans will enjoy learning more about Corona and following along on Rapunzel’s adventures. Howland has created strong female characters who can take care of themselves. For those who watch Tangled: The Series there is only one incident in the book that occurs in the TV show; the rest is entirely original to this story.